This one-day safari tour allows Cape Town visitors to get up close and personal with Africa's most famous animals all just a short drive from Cape Town. This tour is perfect for people wanting to make the most of their time and enjoy a safari without sacrificing too much travel time in the country. 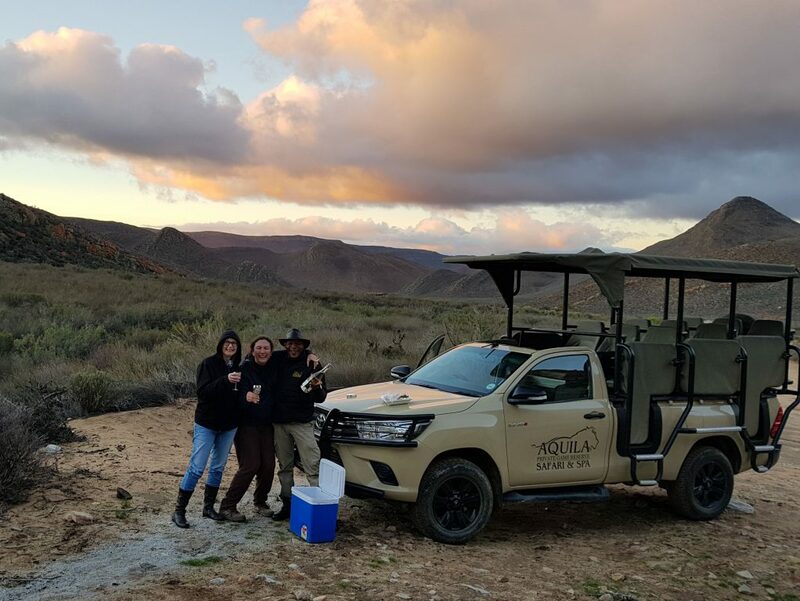 Also, as the reserve is situated in the Western Cape, you will never need to worry about the risk of malaria, and a one-day safari is easily and conveniently slotted into your schedule as a fun day outing to enjoy some of the Cape’s most stunning flora and fauna. Having been proclaimed a Nature Reserve in 1985, the “veld” (terrain) is in pristine condition, consisting of Renoster Veld, Mountain Fynbos and succulent Karoo vegetation types found in 3 beautiful valleys. Situated in the Karoo with its wide open spaces, the 10,000-hectare conservancy has a natural wetland and is protected by majestic mountains and valleys, which makes for varied and ideal game viewing. Wildlife: Aquila is home to the Big 5 - elephant, lion, buffalo, rhino and rare Cape mountain leopard as well as giraffe and hippo. Large herds of game are also found on the reserve, such as black wildebeest, Burchell’s zebra, springbok, gemsbok, steenbok, caracal (lynx), blesbok, bat-eared fox, ostriches, klipspringer, duiker, greybuck, baboon, black backed jackal, eland and red hartebeest. In February 2005, Aquila announced the birth of the first rhino to be born in the Western Cape in 250 years. At the end of 2015 and beginning 2016, another 4 rhino calves were born at the reserve. Birdlife: Aquila is named after the endangered black or Verreaux eagle and is involved in a conservation project for black eagles and other raptors. Aquila is home to approximately 172 species of birds and is also home to several breeding pairs of the rare black eagle. Karoo chat, Rufous-eared Warbler, fairy flycatcher and yellow-bellied eremomela can be found on short walks into the surrounding wilderness. Lark-like bunting and black-headed canary move in after the rainy season. In the summer months, the booted eagle is a regular visitor and the rainy season attracts flamingos to the reserve.